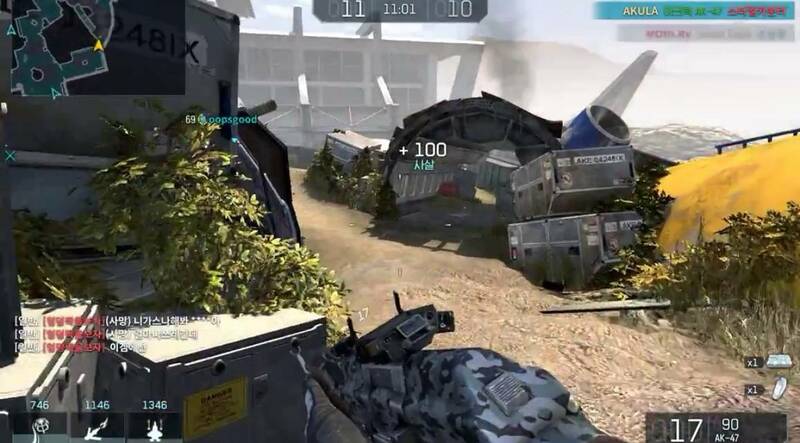 MMOFPS PVP Shooter Game - MMOFPS game that looks and plays like Call of Duty from yesteryear. The action is fast, the gun play is simple, and the gun is fun. Iron Sight is what Call of Duty used to be. Iron Sight starts off with a simple but believable premise. The year is 2025, and natural resources have become scarce in most areas around the world. The Middle East, however, still has a bountiful amount of natural resources, and two main factions began to clash over control of the region. The first faction is the NAF: short for North Atlantic Federation, the group is an alliance formed between the United States and Europe. The second faction is a Russian transnational corporation called EDEN, which contracts mercenaries to do its’ bidding.The “story”, doesn’t have an actual ending as you would expect from an MMOFPS and just serves as an unneeded, but a nice backdrop to explain why all these guys are running around shooting each other. But that’s not why you’re here. You’re here because you want to shoot people. Is Iron Sight a good game to satisfy your multiplayer FPS itch? Let’s find out. As far as visuals go, Iron Sight is rock-solid. Or iron solid is perhaps more appropriate. At first glance, the game could easily be mistaken for a last-gen console shooter in the mold of notable FPS franchises such as Call of Duty, Tom Clancy or Medal of Honor. The graphics are good in general, but particularly for an F2P MMO. F2P MMOs are always a mixed bag in the graphics department, and you never know what you’re going to get, but the devs put in a lot of work here. The game runs on its’ own proprietary Iron Engine and the devs should be proud of the job they’ve done. For the most part, the texture work in this game is good as well. The guns, the drones, and the maps are pretty well done. 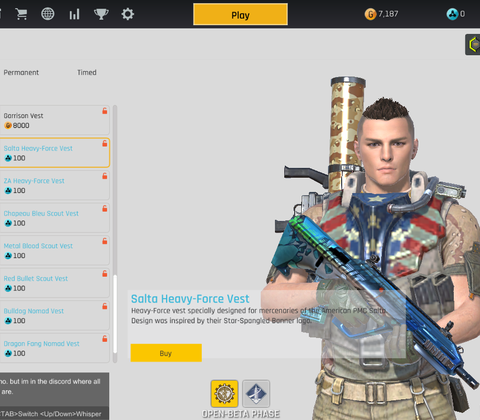 The only notable exception is the tactical vests in the game, which are notable low res. 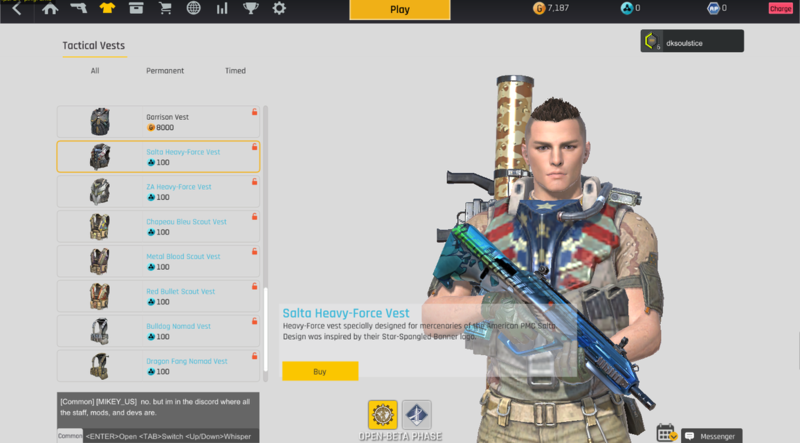 I’m not sure if this is simply an oversight, but whereas the rest of the game looks like something on the PS3, the tactical vests look like something found on a PlayStation 2. Which is a shame because it really detracts from the overall coolness of the design of these items. 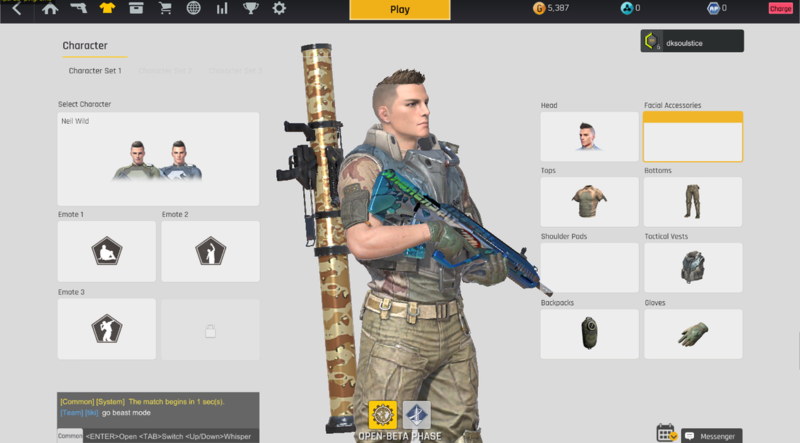 Most of the cosmetic items in the game look good, but tactical vests are notably low res. Iron Sight is no Crysis and so long as you are using relatively modern hardware, you shouldn’t have any problems getting it running. The game runs smoothly at high FPS levels which is always a plus. Iron Sight has 4 PVE and PVP game modes respectively although only one PVE game mode is of any real importance. The first PVE game mode is a tutorial, which was likely thrown in as a formality more than out of necessity. It’s safe to assume that anyone picking this game up, knows his/her way around an FPS. The other three PVE game modes are AI Team Deathmatch- Easy, AI Team Deathmatch- Normal, and EMP. AI Team Deathmatches are good for testing out new loadouts, but Iron Sight isn’t Quake or Unreal Tournament, so don’t expect much of a challenge from the AI. EMP Mission is pretty fun, but no one plays a multiplayer game to fight bots. You do it to fight against other players. 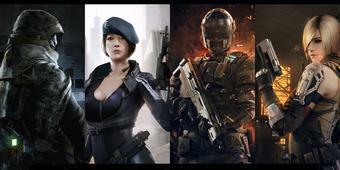 All four PVP Game Modes are what you’d expect from a modern FPS. You’ve Team Deathmatch, Search and Destroy, Resource Takeover, and Secure Point; the last of which is used in the game’s ranked matches. If you’re only interested in one particular game mode, Team Deathmatch, for example, you can alter your preferences so that you only get queued into matches of a certain game mode (s). Unfortunately, the game for some reason doesn’t save your preferences so whenever you exit the game, the next time you log in, your preferences will be reset. Not a huge issue, but still a bit annoying. The game has over a dozen of maps at the moment, and they’re pretty standard for a futuristic FPS. An airport, a dam, an enclosed city-based area etc. Most of the maps are pretty well-laid out, with no choke points where players can cheese through matches. Some of the maps though are too spaced out and as a result, there may be lulls in the action but nothing too bad. I would’ve liked to have seen a bit more creativity on the maps though. The biggest issues with the PVP in Iron Sight at the moment, are a lack of players, and server instability. The game has just officially launched, so hopefully, time will solve that, however, the second problem seems to be a recurring issue with no foreseeable fix in the near future. When the servers act up, the game is completely unplayable as you either sit in a lobby for 5 plus minutes and get kicked out or finally get queued into a match only to get booted back to the lobby seconds later. Adding few to the fire is the fact that the devs don’t seem to have an overnight support team. Wiple Games is based in South Korea, so if the servers start acting up in the middle of the night South Korea time, you might as well pack it in as there won’t be a fix until morning. Now for the part a lot of you have been waiting for; what toys does Iron Sight let me play with? A lot of them. More than 100 guns alone. Pistols, SMGs, LMGs, Assault Rifles, Sniper Rifles, and Shotguns. You’ve also got things like a crossbow, an EMP Launcher, and even exploding throwing knives. And yes, those are as awesome as they sound. Rambo would be proud. For those of you more interested in things that go boom, the game gives you plenty of those as well. Of course, you’ve got your standard frag grenades, but you’ve also got 5 non-lethal grenades: Smoke, Flash, Decoy, Shock, and Tear Gas. These don’t seem to see too much use, but it’s nice to have options. You’ve also got more trap-related explosives such as claymores, sticky grenades, spring mines and remote bombs; all very useful in defending a secure point in particular. With more than 100 weapons at your disposal, the loadout options are limitless. Another key part of your loadout is your drones. 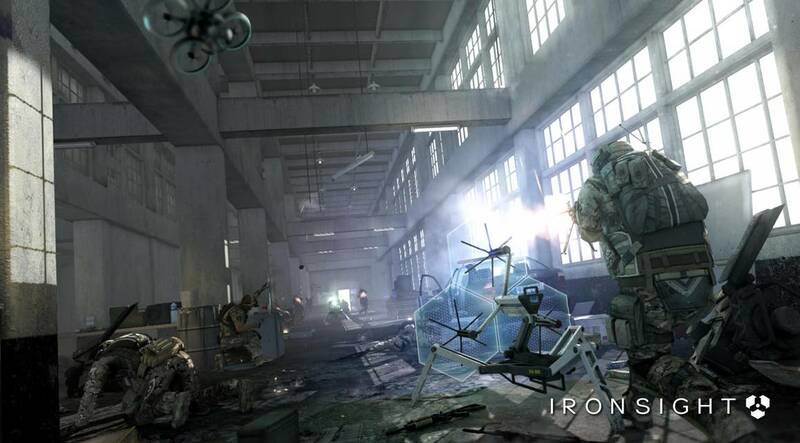 Drones come in two varieties in this game: Offensive and Tactical. Both of which serve self-explanatory purposes. Tactical Drones include things like Spy Drones and UAV Jammers while Offensive Drones include nasty things like Blade Drones, the old reliable Hellbird and the Metal Reaper; a gigantic mech that can devastate the enemy team. Unlike weapons, most of which you have to unlock, you have access to all drones from the start. Drones are where the kill count system comes into play, and you’ll need to rack up points by getting assists, kills and breaking kills streaks in order to use them. So it’s wise not to take in three drones that all take a lot of points to use, or you might not be able to use them all during a match. There are two unavoidable questions that come to mind whenever a discussion about an F2P MMO is being had: Are the microtransactions bad, and is the game P2W? Satisfyingly, for Iron Sight, the answers are no and no. 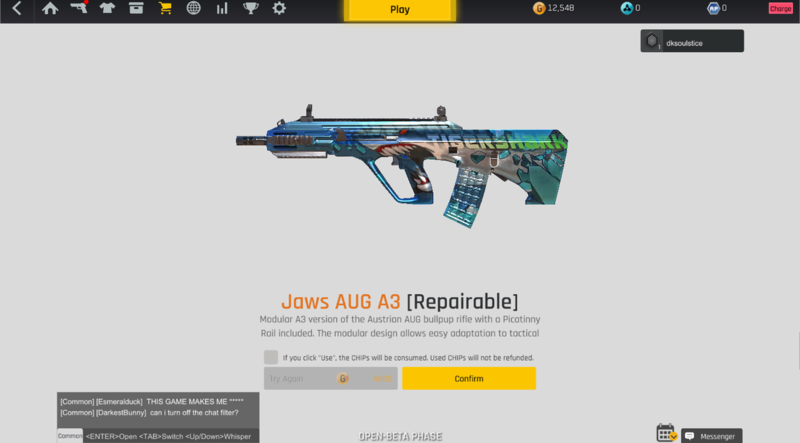 Most of the microtransactions in Iron Sight are purely for cosmetics. And that’s how it should be. You do need to repair your weapons after matches, which takes up gold (the game’s earnable currency), but the repair costs are never steep. You earn gold through a number of ways, the easiest being by simply playing matches. You also get gold from leveling up, completing challenges, and from logging in via the daily login rewards. 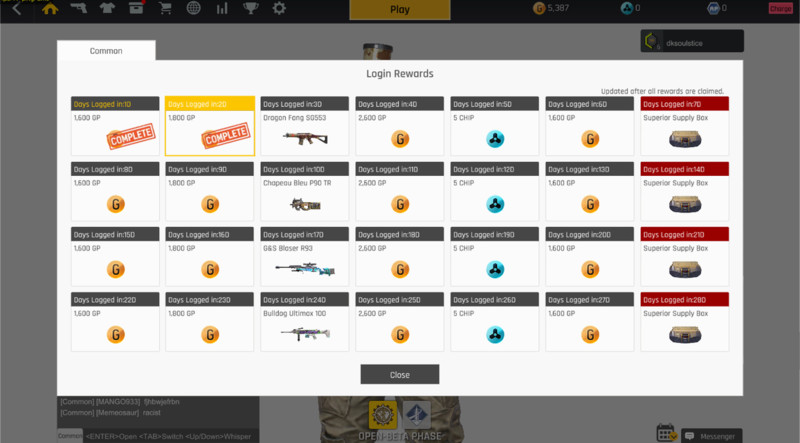 Wiple Games is very generous with the daily log in rewards. 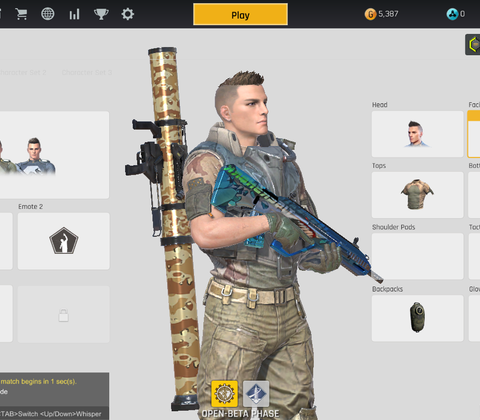 Most cosmetic items in the game, be they gun skins, helmets or shirts, can be purchased with gold. Some (And admittedly) can only be purchased with purchased with chips, the game’s premium currency. Special offers can also be purchased with AP; Aeria Games’ own umbrella currency for all of the games. Iron Sight also has the expected loot crates, in the forms of supply and superior supply chests. These can be bought with either earnable or premium currency. I tried a few out, and they seem fair. You can get anything from these things, gloves, scopes, sights or even new guns. 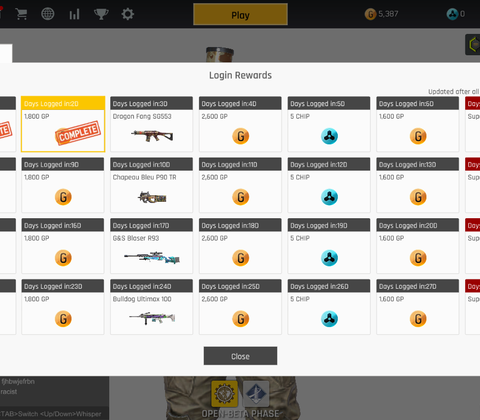 One of the items I received from a superior supply chest. 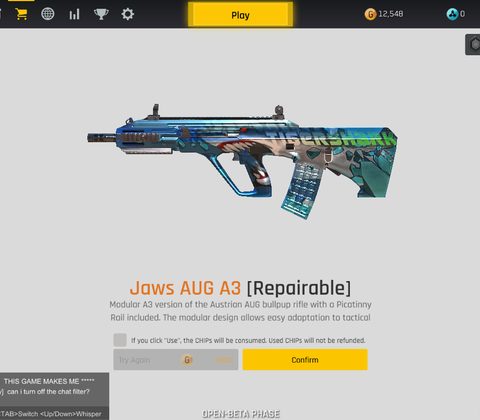 Yes this game has Jaws-themed skins. And again, you don’t need to buy anything in this game with your own hard-earned money, and playing as an F2P player is more than possible. Iron Sight is a breath of fresh air and a shining example of how an F2P MMO should be. Make no mistake. There is nothing on offer in Iron Sight that is groundbreaking or in any way reinvents the wheel. The game draws inevitable comparisons to Call of Duty, and for good reason; it looks and plays like a yesteryear Call of Duty. And that’s not a bad thing. The multiplayer FPS genre is dominated by three titles at the moment: Overwatch, Fortnite, and PUBG. All of which have their own unique quirks that make them stand out from the crowd. Said quirks, however, are not for everyone. Some gamers like their FPS games to be more simple. And that’s where Call of Duty comes into play. Or used to anyway. After more than 10 years as undisputed genre king, CoD has fallen from grace and is almost taboo nowadays. However, there was once a time when Call of Duty was a darn good time. And Iron Sight perfectly encapsulates why. Iron Sight is fun. It’s simple and fast-paced. It’s a game you can play for a few minutes or a few hours. Despite the F2P MMO label, it doesn’t suffer from problems that plague a number of F2P MMOs, and it doesn’t employ an obnoxious microtransactions game model that pushes people away. It’s a great game and well worth playing. 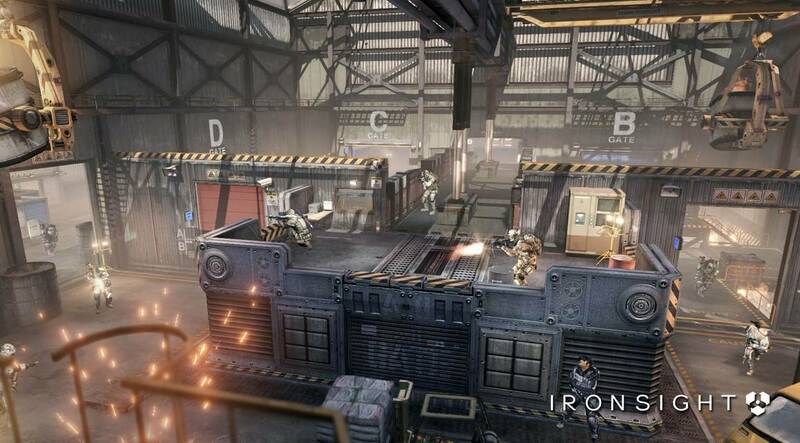 Ready to enter the world of Ironsight ? Click here to play now! Ironsight doesn't have much in the way of originality. At all. In most cases, that would be a bad thing, but in the case of Ironsight, it's actually one of the game's biggest strengths. It plays like Call of Duty back when Call of Duty was fun.